A windmill on the skyline signals its location. From its courtyard, two paths lead up to the windmill, one through a copse of cactus, the other through a terraced olive grove. 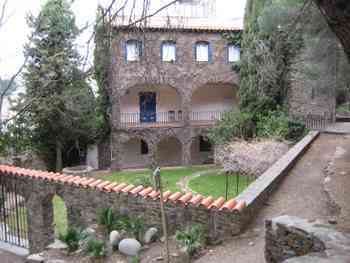 Its neighbour is Le Dominicain, until 1926 a monastery and since then a winery of AOC Collioure and Banyuls. The Museum is newer. It was opened in the early 1980s at the behest of a group of art enthusiasts, who persuaded the municipality to buy the villa theretofore owned by Gaston Pams (1918-1981), the Senator from the Pyrénés-Orientales. But its roots go back to two brief years at the beginning of the 20th century, when Collioure was a stronghold of the Fauvism movement in modern art. The movement began in 1905 when Henri Matisse and André Derain arrived in Collioure. They had been students of Gustave Moreau, the École des Beaux-Arts professor who had inspired the movement facetiously named by a critic after Fauves, French for “wild beasts”, for its daring colours. The movement ended in 1907, but reverberations of it rippled throughout art, noticeably including Picasso’s two years at Céret 1911-1913. Today, the Museum features exhibitions of modern art and hosts festival events. It is a “window open on Fauvism” that extends beyond its walls, in the Chemin du Fauvisme, a walking circuit of reproductions of works at 20 sites around Collioure. And despite its name, it goes beyond modern art. It is the home of a Foundation in memory of Spanish poet Antonio Machado, who fled the Spanish Civil War and in 1939 died and was buried in Collioure. And it’s a repository of information on Anglo-Irish novelist Patrick O’Brian (1914-2000), who lived in Collioure from 1949 on and wrote many of his famed sea stories there. Fittingly, one of the principal characters of the stories is Dr. Stephen Maturin, who is Irish-Catalan. Musée d’Art moderne de Collioure, Villa Pams Route de Port-Vendres, 66190 Collioure, Tel: 04 68821019, www.collioure.net/musee.asp .